Day 1. Welcome to Reykjavík! On your first day, you arrive in Reykjavík, the capital of Iceland. After your airport transfer you settle into your first-class hotel. Depending on your time of arrival, you have time before a delicious welcome dinner to explore this magnificent city. Iceland is rich in unique natural wonders. In the southwest, they are so close to one another that you can see several in a single day during the classic Golden Circle Tour, which takes you through the Thingvellir National Park to the Gullfoss waterfall and to the famous Strokkur fountain geyser. In the morning, you say goodbye to Reykjavík and take a scenic bus ride northward on Iceland’s Ring Road. You pass through small settlements, mountains, fjords, and plateaus before you arrive in the Capital of North Iceland, Akureyri, at noon. Here you enjoy a brief city tour then board the MS Plancius, where your friendly crew welcomes you aboard. After getting settled in your cabin and a short safety demonstration, you weigh anchor and start your Arctic expedition cruise! Your ship cruises along Iceland’s longest fjord, the Eyjafjord, where you keep an eye out for passing whales and flocks of seabirds. September is one of the best times of year to witness the astonishing light show of the Aurora Borealis. On a clear night here on the north side of the island away from the city lights, the view is simply spectacular. Today the MS Plancius crosses the Arctic Circle and the Denmark Strait, situated between Iceland and Greenland. Here you are almost guaranteed to observe seabirds like Arctic fulmars, black-legged kittiwakes, and thin-billed murres. With a bit of luck, you’ll even see whales. In the evening, you draw close to Cape Brewster, where you might catch a glimpse of polar bears swimming along Greenland’s eastern coast. After your trip across the Denmark Strait, you enter the Scoresby Sound, the largest fjord system in the world! Here your ship cruises along the heavily glaciated Volquart Boons Coast, where you embark upon a zodiac tour past immense, baby-blue icebergs of every shape imaginable. The 90-meter-long MS Plancius seems small in comparison to these ice giants. Depending on the mid-September weather, sea ice is beginning to form on the water’s surface, and otherworldly cliffs of black basalt are already covered with a fine layer of snow. During an excursion on Danmark Island, you visit the ruins of an Inuit settlement abandoned almost 200 years ago, where you can see the archeological remains of polar bear-proof pantries and graves. Later that evening, your cruise continues through ever narrower fjords surrounded by oddly shaped icebergs. Today you embark on another zodiac tour, this time around Red Island, where you marvel at some of the most beautiful icebergs yet. Their periwinkle hue creates a beautiful contrast with the brick-red sediment of neighboring hillsides. You can feel the cold emanating from these colossal masses and can just make out the faint crackling and murmuring as they move almost imperceptibly in the stillness. Farther north, in Rypefjord, you go ashore and walk among the beautiful autumn colors of the tundra, where you might even encounter a small herd of muskoxen. Your captain expertly maneuvers along giant icebergs, providing you with spectacular views of icebergs of up to 100 meters high and more than a kilometer long. At Sydkap, you visit the ruins of a winter village that dates back to the Thule culture, the ancestors of the modern Inuit people. The remains of up to 20 people were found here in tiny dwellings made out of whale bone and sod, protection from the weather and from polar bears. Keep your camera ready, because you might get lucky and see muskoxen, Arctic foxes and snow hares. Overnight the MS Plancius has made its way eastward and now continues toward the mouth of the Scoresby Sound. After an excursion on the southern tip of the Jameson Land peninsula, where wader birds and wild geese gather in their autumnal migration, you rejoin civilization. In Ittoqqortoormiit, the northernmost settlement on Greenland’s eastern coast, you get insight into the everyday lives of Greenlanders. 800 kilometers farther south, you make a stop at another village, whose approximately 400 inhabitants live in isolation from the outside world. Sled dogs doze outside of colorfully painted wooden houses, where animal furs and skins have been stretched and hung out to dry. Back on board, you say farewell to Greenland—the MS Plancius sets off once again on the open sea. 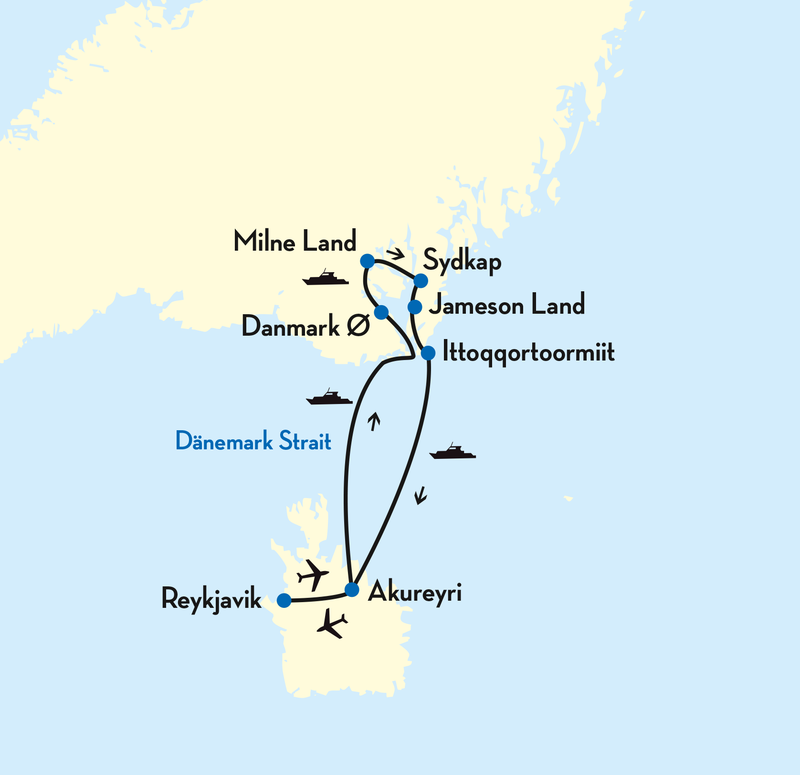 The last day of your cruise takes you back across the Denmark Strait. On board your guides deliver exciting talks about the region and always keep you on the lookout for whales and seabirds. On a clear night, you can see the fascinating northern lights glowing in the sky. In the morning, you say farewell to your expedition ship and its lovely crew. Back in the port of Akureyri, a bus is waiting to take you south around Iceland’s Ring Road back to Reykjavík. After you get settled into your centrally located hotel, you still have time for an easy walk through the Icelandic capital. Join us on a unique expedition cruise to the virtually uninhabited East Coast of Greenland away from the typical routes of large entertainment vessels. From the Capital of North Iceland, Akureyri, you set course for the Scoresby Sound and cross the Arctic Circle ever on the lookout for the region’s diverse seabirds, whales, and of course—icebergs! Watch as these frozen giants rise majestically out of the jagged, fjord-filled seascape of the Volquart Boons Coast. In September, the tundra is dominated by the brilliant yellows and reds of Arctic flowers. Sea ice is just beginning to develop, and mountain peaks as high as 2,000 meters are powdered with fresh snow. Although the days are long at this time of year, there is still a chance to see the northern lights glowing in the sky at night! The itinerary for this adventure provides an accurate glimpse of what to expect. However, as with any expedition cruise—flexibility is a feature. The exact route of your journey depends on ice and weather conditions. Your expert sea captain and experienced expedition manager decide on the perfect course to maximize your enjoyment of these pristine landscapes. Deluxe cabins are outside cabins and feature private bathroom and shower, closet, desk and chair, hair dryer, and TV. They are situated on Decks 4, 5 and 6 and are about 226 sq ft/21 sq m in size. They feature at least two windows, a double bed, a sofa, a refrigerator, a tea and coffee station, a bathrobe and ample storage space. Superior cabins are outside cabins and feature private bathroom and shower, closet, desk and chair, hair dryer, and TV. They are situated on Deck 4 and are about 134.5 sq ft/12.5 sq m in size. They feature either one or two windows and two lower beds. 2-bed cabins are outside cabins and feature private bathroom and shower, closet, desk and chair, hair dryer, and TV. They are situated on Deck 3 and are about 134.5 sq ft/12.5 sq m in size. They feature one porthole and two lower beds. 3- and 4-bed cabins are outside cabins and feature private bathroom and shower, closet, desk and chair, hair dryer, and TV. They are situated on Deck 2 and are about 134.5 sq ft/12.5 sq m in size. They feature one porthole window and two lower beds and either one or two upper beds.